← Now why don’t he write? 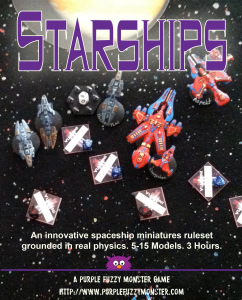 So Jump War is now Starships, or Purple Fuzzy Monster’s Starships, if you’re not into that whole brevity thing. I’ve got a page for it on the web site here. I’m demoing it at Kingdom Con in San Diego on Friday (April 25th) from 2–6 pm in the main hallway, and again on Saturday from 10am – 6pm (minus a lunch break at 1pm). The plan is to make the rules available via Wargames Vault just before the con. Optional personality cards should be available about a month after that. This entry was posted in Jump War, Starships and tagged announcements, conventions. Bookmark the permalink.